It’s a big year for the Durango Independent Film Festival — the Big 10! This year marks the festival’s 10th anniversary (although not consecutively), and the traditional gift for the 10th anniversary is tin or aluminum, so keep that in mind when you’re shopping. Anyway. This year’s festival runs March 4-8, and festivities promise to be a doozy to mark the occasion. 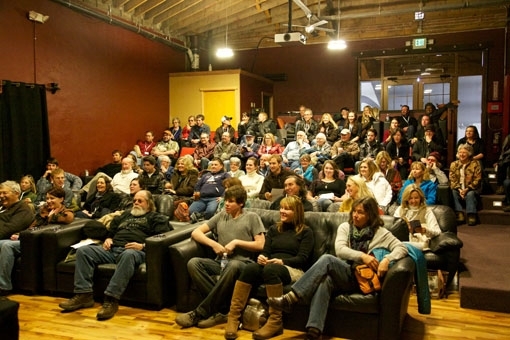 Durango Film puts together an impressive shebang for filmmakers, visitors and special guests. This year’s program lineup features dozens of movies: features and shorts, animated family films and adventure sports movies, documentaries and Native American films. Festival events also include filmmaker’s panels, casting panels, a craft beer crawl, a Native American film reception, a late-night VIP party and more. Festival Kickoff Party: 4-6:30 p.m. at the Palace Restaurant, 505 Main Ave. Let’s get this party started! The kickoff shindig is open to all First-Tier pass holders (except for All Film pass holders) and includes food and beverages. Free Movie Night: 6 p.m. and 9 p.m. at the Gaslight Theatre, 102 E. Fifth St. Free movie night is sponsored by The Durango Herald. Although priority seating will be given to First-Tier pass holders, the movie is open to the public. Native American Film Reception: 4:30-6:30 p.m. at Sorrel Sky Gallery, 828 Main Ave. Meet the filmmakers during the reception at a gorgeous art gallery. The event is open to the public, and refreshments will be provided. Craft Beer and Culinary Crawl: 5:30-8 p.m. at a variety of downtown Durango restaurants, breweries and galleries, including Brew Pub & Kitchen, Carver Brewing Co., Eolus Bar & Dining, Open Shutter Gallery and Toh-Atin Gallery. Pairings will feature local food and local Durango breweries, including beers and suds from Steamworks Brewing Co. and Durango Brewing Co. Festivalgoers can start at any place on the pub-slash-food crawl and make their way to all locations by 8:30 p.m.
Meet the Filmmakers Party: 5-9 p.m. at the Irish Embassy Pub Ambassador’s Lounge, 900 Main Ave. Rub elbows with the filmmakers (who knows, maybe Scorsese will show up?) and network in the filmmakers’ lounge as you drink from the cash bar. Maybe you can pass along that script you’ve been working on. The party is open to all festival pass holders. The Filmmaker’s Panel: 11 a.m. The Casting Panel: 1 p.m.
Late Night VIP Party: 10 p.m.-1 a.m. at Chimayo Stone Fired Kitchen, 862 Main Ave. Pre-party with some espresso and get ready to dance (or drink or whatever) the night away during the VIP party. The event is open to 21-and-older First-Tier pass holders and features food and drinks of the adult variety. The Students of the Screen Panel: 11 a.m. The Writer’s Block Panel: 1 p.m.
Festival Wrap Party: 8 p.m.-midnight at the Irish Embassy Pub Ambassador’s Lounge, 900 Main Ave. It’s a wrap! End the festival with the wrap party open to all First-Tier pass holders and enjoy food, beverages and live music by The Assortment. We love movies, and we love the film festival as much as you do, so stay with us at the Durango Quality Inn. We can talk about our favorite films! Book online or call us at 970-259-5373 to make your reservation today.